David Swanson - World Beyond War . . .
DAVID SWANSON — Virginia, U.S.
David Swanson is an author, activist, journalist, and radio host. 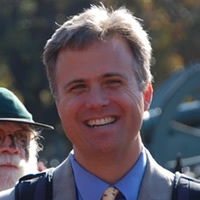 He is director of World BEYOND War and campaign coordinator for RootsAction.org. Swanson’s books include War Is A Lie and When the World Outlawed War, as well as Curing Exceptionalism, War Is Never Just, and War No More: The Case for Abolition. He is co-author of A Global Security System: An Alternative to War. He blogs at DavidSwanson.org and WarIsACrime.org. He hosts Talk Nation Radio. He is a 2015, 2016, 2017 Nobel Peace Prize Nominee. Swanson was awarded the 2018 Peace Prize by the U.S. Peace Memorial Foundation. David holds a Master’s degree in philosophy from the University of Virginia and has long lived and worked in Charlottesville, Virginia. Longer bio. Sample videos. Areas of focus: Swanson has spoken on all variety of topics related to war and peace. Facebook and Twitter. I read and enjoyed your recent article, “The CIA Never Lies”. Toward the end of your article you referred to several of the many countries that we, the US, have destroyed and I wish that you had included Yugoslavia in your list. It seems that nearly everyone omits that country when listing the scenes of our atrocities yet this year a man named Robert Bauer has publicly admitted that he had headed a CIA team that the US had sent into Yugoslavia for the purpose of breaking up the country by stirring up old griev ances among the component peoples by telling them, falsely, that Serbia was going to attack them! The name of the article in which he admitted this was something like “Wake Up Croatia and Bosnia, You’ve Been Hoodwinked!” In addition, this past summer the Tribunal for the Former Yugoslavia issued its verdict on Slobodan Milosevic, the supposed “Butcher of the Balkans,” who was the asserted reason for the aggression against Serbia, finding him NOT guilty! The tribunal said that not only had he not committed ethnic cleansing, he had tried to stop it! Where is the outrage about this? Where are the reparations to Serbia for the War Crimes we committed there? And for the lives destroyed? We deliberately destroyed that country and dropped bombs on Europe–the first since WWII. Sorry for the rant. I would never dare attempt to list all wars or all US wars or all US attempts at overthrow or anything of the sort, and when I give a small sample list I do not mean it to diminish any of the others that I understandable tend to hear about 🙂 You are right and I’ve included that example in my books. It is true that the US has intervened in many countries using covert operations such as the break up of Yugoslavia. However one should also keep in mind that although the US prodded them and even armed the Yugoslavs for many years, Serbia and Croatia were both just as responsible for the deaths of over 200,000 Muslims. In which the Serbs killed over 8,000 in Srebrenica in one day. I would like to make it a point that the Serbs and Croats are victims of civil war, but that the most injustice done was to the ethnic cleansing of Muslims by the Croats and Serbs which unspeakable atrocities were committed in the name of Orthodoxy and Catholicism. I did not know of the serbia milosovic truth, but i am not surprised. I hope people outside the US don’t equate our govermental actions with me and my wife. I am ashamed to be a us citizen but don’t know where to go, so i fight on. Would like specific citation of Robert Bauer’s comments on CIA efforts to break-up Yugoslavia. I also track CIA interference in the internal affairs of other nations.